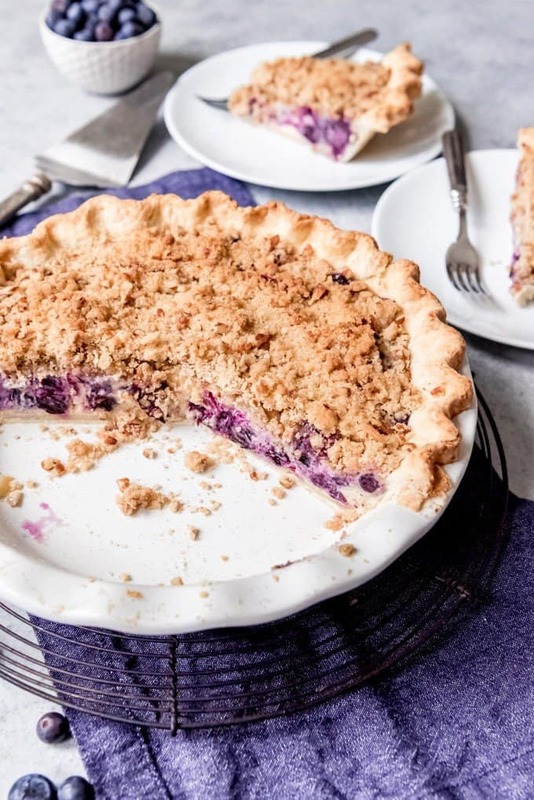 Juicy fresh blueberries, creamy sour cream custard, buttery streusel crumble topping with chopped pecans, all in a flaky crust – this Blueberry Custard Pie won the “Pie Most Likely To Bring About World Peace” award at our annual Pi Day pie party for good reason. Originally posted September 16, 2016. My friend, Christina, brought this pie to our annual Pi Day pie party a few years ago and everybody went crazy for it. 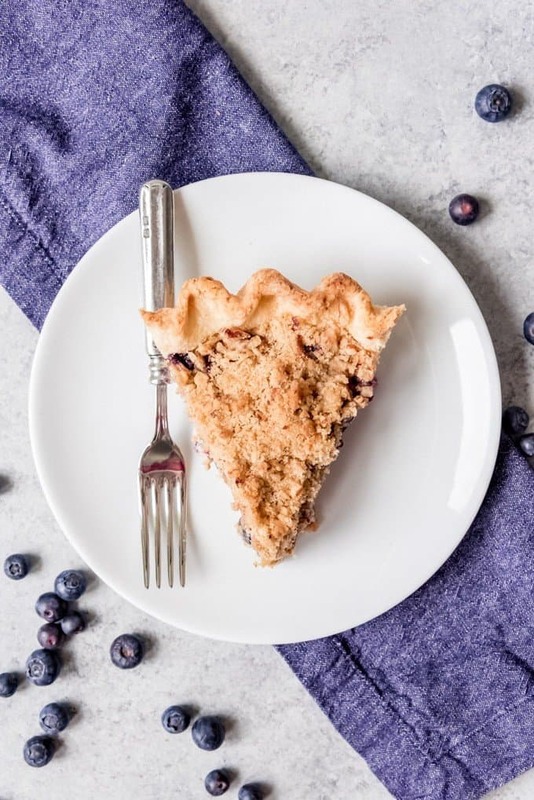 Christina always brings the BEST pies and pretty much wins in at least one category every year, so it wasn’t a surprise that we all loved this blueberry custard pie. 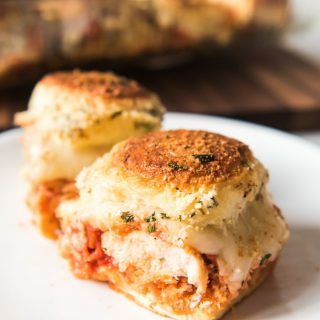 I first posted this recipe back in 2016 shortly after starting this blog and pretty much only my mom, sisters, and a couple of friends were reading it. It has hardly seen the light of day and that’s a shame since we make this pie often, especially around Easter, which is why I’m republishing it with new photos now. The blueberries in this pie are so juicy and bright and set in a deliciously simple and light sour cream custard. And the buttery streusel on top adds a warm, nutty crunch that is perfect with the smooth, sweet filling. 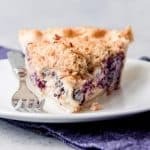 This is the perfect pie for someone like my husband who prefers streusel over pie crust and cream pies over fruit pies. Although I have to say that the classic pie crust on the bottom is one of my favorite parts of this pie because it’s so flaky and buttery and good! I’ll admit when I first saw the list of ingredients, I was surprised that the custard base is pretty much just an egg, some sour cream and a little sugar and flour. When you mix it all together it doesn’t look like much. But have faith because it something magic happens when all of those things combine together and envelope lots of fresh blueberries. 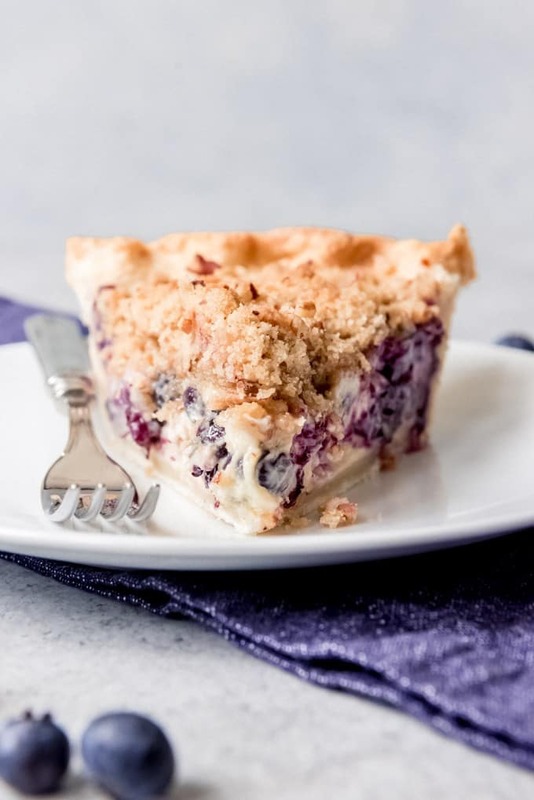 It bakes into a soft, sweet custard filling with bright bursts of blueberry flavor that make you think of sunshine and summertime. 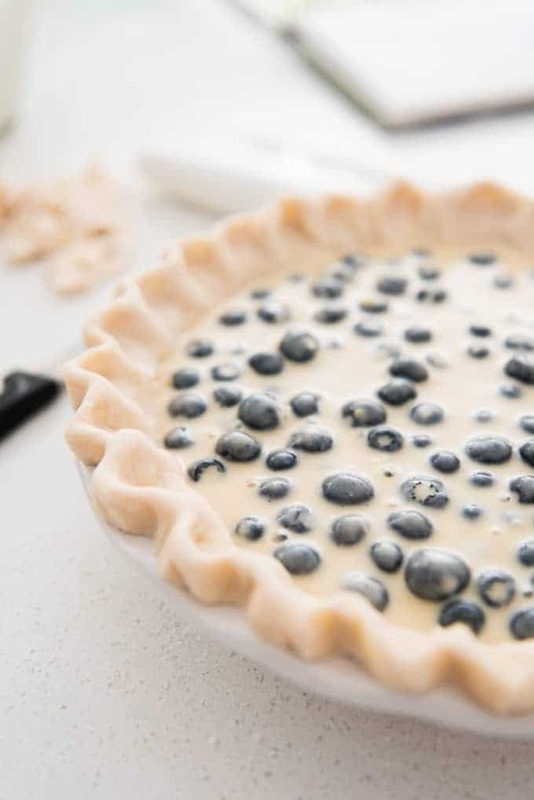 This blueberry sour cream custard pie is a delicious, creamy and exciting twist on the classic blueberry pie. We make it for Thanksgiving, for Easter, for summer get-togethers, and basically everything in between. I think you’re going to love it. And it really just might bring about world peace. This is such a great pie to make because there is no need to blind-bake the bottom crust and no top crust to worry about. Just make your bottom crust and roll it out, then carefully lay it in the bottom of your pie dish. I like to crimp the edges just to make it look pretty. In a large bowl, whisk sour cream, sugar, an egg, flour, vanilla, and salt. Then fold in a bunch of fresh blueberries. 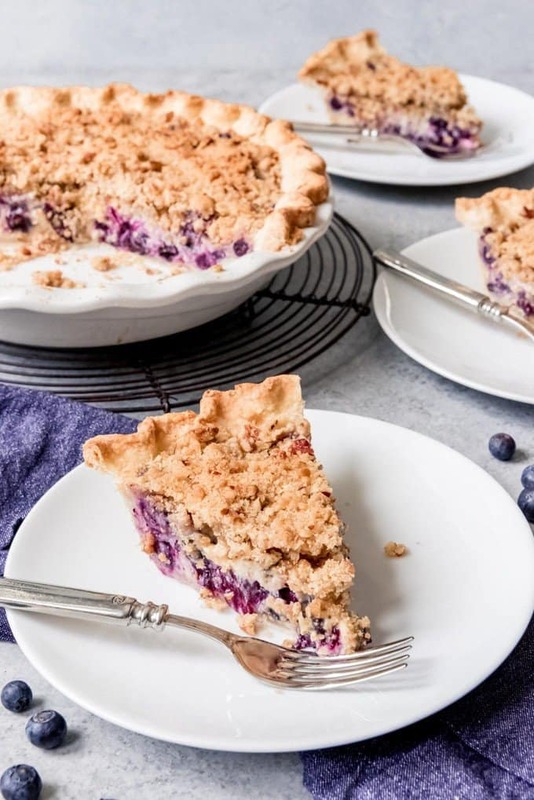 You could use frozen blueberries, but I don’t recommend it for this particular pie, especially since it relies so much on the fresh blueberry flavor coming through. Bake the pie in a 400 degree F oven for 25 minutes. Meanwhile, in a medium-size bowl, combine the flour and brown sugar for the streusel topping and cut in the butter using a pastry cutter or just by using your hands. Add in the chopped pecans and set aside. When the pie has baked for 25 minutes, pull it out and sprinkle the streusel topping over the top, then return the pie to the oven for 15-20 minutes until the filling is set and the topping is golden brown. If the crust looks like it is getting too dark around the edges, put a pie protector or tinfoil around it so it doesn’t burn. Let the blueberry sour cream custard pie cool for at least 30 minutes. 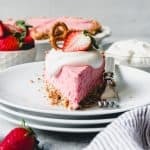 This pie can be served warm, although it won’t be completely set up until it has cooled completely and chilled in the fridge for a couple of hours. I tend to prefer this pie chilled, but it’s delicious either way. Love pie? Me too! 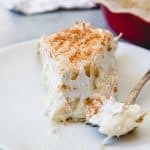 Here are some more of my favorite pie recipes for you to try! 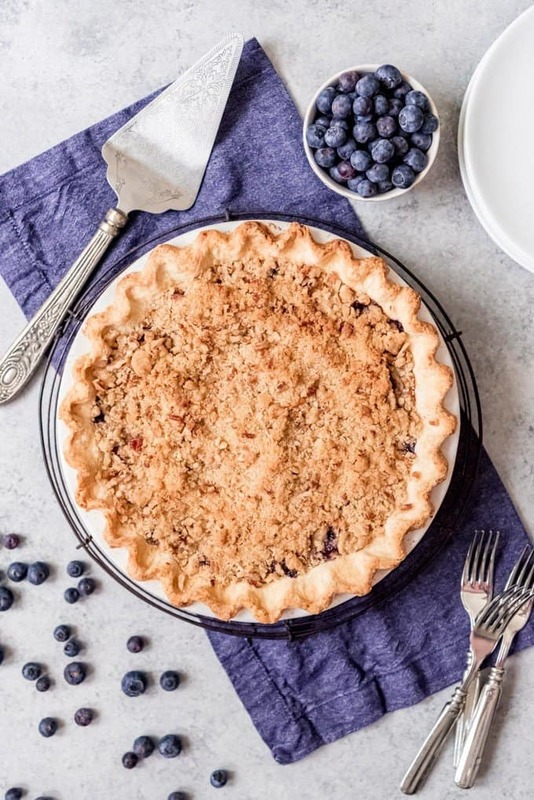 Juicy fresh blueberries, creamy sour cream custard, buttery streusel crumble topping with chopped pecans, all in a flaky crust - this Blueberry Custard Pie won the "Pie Most Likely To Bring About World Peace" award at our annual Pi Day pie party in 2016 for good reason. Prepare 1 single-crust pie crust and line a pie plate with it, trimming and folding edges under and crimping into a decorative scallop with your fingers. Set aside while preparing the filling. In a large bowl, mix the sour cream, sugar, egg, flour, vanilla and salt until smooth. Gently fold the blueberries into the custard mixture. If you stir the blueberries in too vigorously your whole pie will turn purple! Pour into the unbaked pie crust and then bake in the preheated 400 degree oven for 25 minutes. While the pie is baking, prepare the streusel topping. In a medium bowl combine the brown sugar and flour. Mix in the butter with a pastry cutter or just using your hands until crumbly. Mix in the chopped pecans. 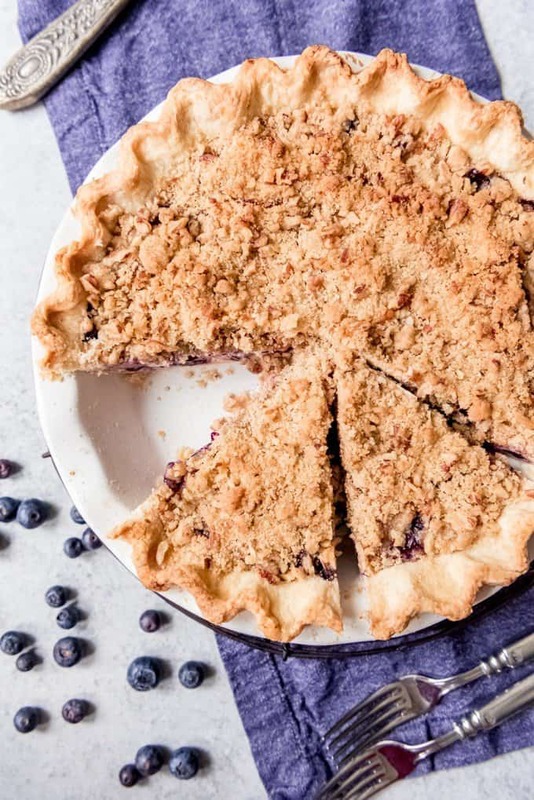 When the pie crust and blueberry custard filling has baked for 25 minutes, pull it out of the oven and sprinkle the streusel over the top of the pie. Bake for an additional 15-20 minutes or until filling is set and topping is brown. Watch your crust to make sure it doesn’t burn. Either use a crust shield or make a loose foil tent towards the end of baking to protect the edges of the pie from burning. Remove from oven and let pie sit for at least 30 minutes. This pie can be served either warm or cold - it's delicious either way! Thanks, Christina, for bringing this pie into my life! 🙂 Custard filling and streusel topping lightly adapted from Mel's Kitchen Cafe, who based hers on The Girl Who Ate Everything, who created her recipe from All Recipes. Obviously this pie has made the rounds! The pie crust recipe is my favorite for a single-crust pie and can be found in this post for a Perfect Pie Crust. I also wants to thank your friend..pie looks so tempting.. a delicious dessert ! Your photos are lovely! I can smell this pie through my screen. If it’s a custard pie, it can’t be wrong. Nicely done! I love blueberry pie in all its variations, and this sounds delicious! I can relate to having recipe testing failures, and I won’t post until I get it right. Nice photos by the way! Thanks, Andrea! I know, I won’t just post something unless I feel confident about it to. It is so frustrating when things don’t come together the way you envision it! One of our favorite fruits in a Custard Pie! Excellent!!! What a delicious looking custard pie, it would be such a treat for the whole family. 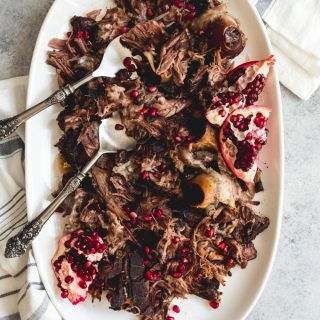 Perfect for the festive season too! 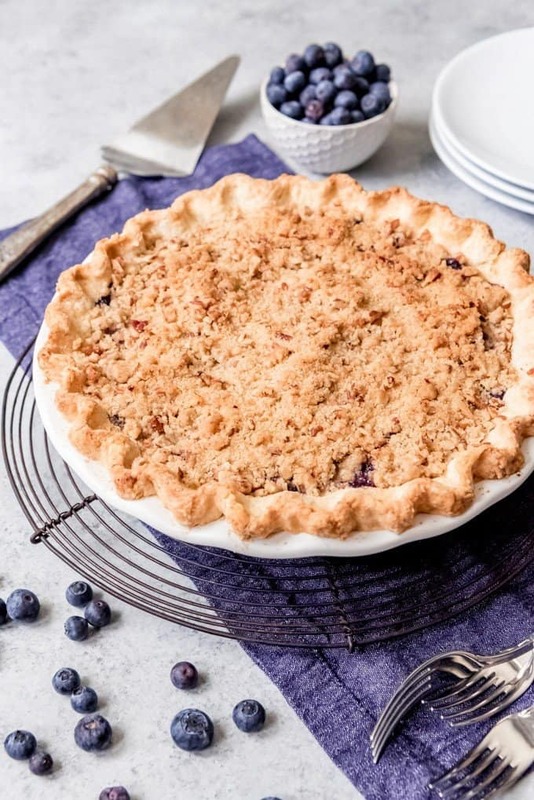 This blueberry pie looks incredibly delicious! I’m loving that crinkled pie crust! This pie looks beautiful, very excited to try it! 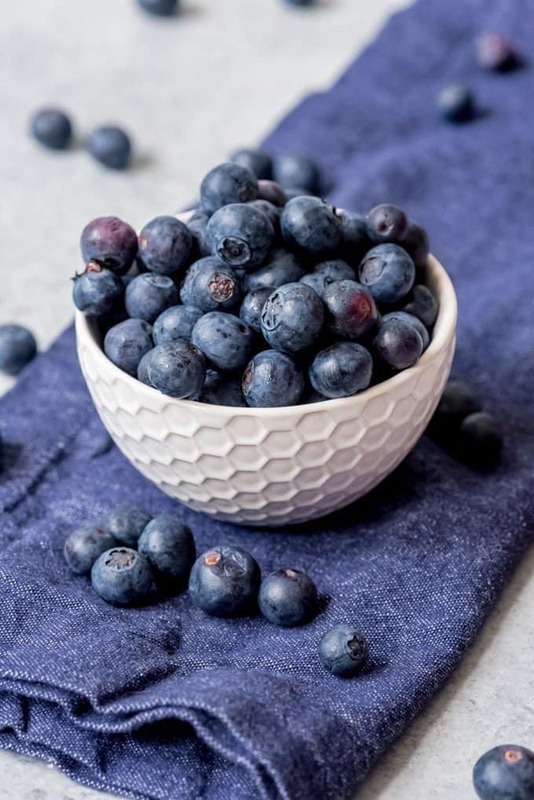 I just wanted to ask – can frozen blueberries be used in this recipe? Thanks, Jelena! I think you could use frozen blueberries and it would turn out okay, although fresh is definitely preferable (as long as they don’t cost an arm and a leg!) since they are the star of the show here. 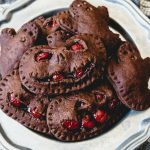 If you try it with frozen blueberries, I would love to hear what you think! I am trying your recipe today and I just wanted to make sure that a pre-bake of the crust is not necessary? Most custard pies call for a pre-bake so I just want to make sure I won’t have a soggy bottom if i pour the custard into an unbaked shell. Thanks for any advice! 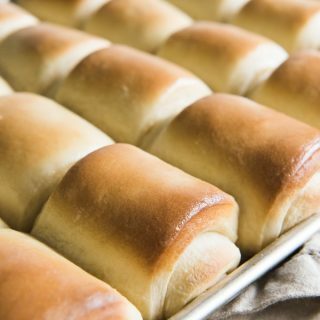 I have never had a problem with the crust being soggy on the bottom – it gets cooked for a full 45 minutes. But you could try par-baking it for 10 minutes before filling it, if you are concerned. Just be sure you cover the edges for the full cook of the custard filling then because otherwise the crust will definitely burn around the rim of your pie dish. The pie rather exploded in my oven in the last 10 mins or so of cooking. Filling leaked out over the edges. Maybe when I put the heat shield the edges on the steam built up. Dunno, but quite a mess in my oven at the moment. Hopefully the remaining pie will be yummy. I wish the recipe said more about how to tell if the pie is cooked – ie how set the filling out to be, and how to tell. Any tips? Oh no! I wonder what happened that would make it explode?! Because it is a custard pie, I think it’s important to follow the timing pretty closely to know when the pie is done. But the crust is a good indicator on it’s own when it starts browning. I like to do a jiggle test to see whether the filling is “set” by just moving the pie around a bit in the oven. If the filling is still very jiggly and wet looking, the pie isn’t done. When the filling is set and doesn’t jiggle too much, it’s done. Because it’s a custard pie, it might not be completely “set” when you take it out of the oven. The pie will need some time to firm up. So setting a timer and making sure your oven cooks at temperature by purchasing an inexpensive oven thermometer is probably your best bet. A few months ago, I asked my father if there were any childhood desserts he’d like me to make. He tentatively suggested a blueberry sour cream pie. I saved this recipe and promptly forgot about it. Three weeks ago, I pulled this out of the archives and whipped it up. It was gone in two days. My dad now brings me the highest quality blueberries he can find as frequently as he can. I’m drowning in blueberries, despite the fact that I’ve made this pie four times in three weeks. This pie is in the oven right now! You are so welcome! I’m so happy that your dad is enjoying this dessert and that you are taking full advantage of blueberry season! That makes me so happy. Can this pie be made a few days in advance of serving? Can the baked pie be frozen? I am short on time but would love to make it for Thanksgiving – I need to transport it on a 2 hour flight as carry-on in a pie carrier. I appreciate any guidance you can provide! Thank you! Hmm, I have never frozen this pie before, so I really can’t say how this one would turn out. I’m sorry! It’s a delicious pie but probably best won’t transport as easily as other options. I’m so glad you brought it and shared it, Christina! I can’t even count how many times I’ve made it since that party!